In Kansas City, house painting can mean a variety of things. Maybe you're tired of the look of old, faded vinyl siding; maybe it's time to reseal your wood or fiber-cement siding. Or, maybe you're interested in refreshing the look inside your home, but don't have the money for a major home remodel. Few projects have the potential for a dramatic change in your interior decorating for the cost of less than one week's paycheck. Of course, many homeowners elect to take on their own house painting projects. Yet, professional Kansas City home painters are great resources for homeowners who want superior finishes, convenience, and more decorative painting options. From Overland Park to Olathe, Shawnee to Lee's Summit, and throughout the greater KC area, we've helped homeowners find the right Kansas City home painter for all their painting needs. House painters may offer any type of painting services, or they may specialize in one type of house painting. Certainly, different benefits accompany farming out interior and exterior projects to the pros. 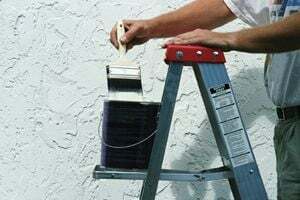 While bending down to paint the bottom third of interior walls can be a considerable challenge for homeowners with back and knee problems, people with any type of limited mobility are going to experience considerable difficulty painting the exterior of their home. General safety, along with quality and durability, is at stake with many exterior house painting projects. Interior house painters, on the other hand, offer specialty painting techniques, including faux finishes and murals, that can bring more dramatic results than a typical homeowner could accomplish. Plus, while exterior painting can involve negotiating rough ground and hedges, furniture must be moved and carpet protected inside. Most painting companies will take care of everything in terms of set up and clean up. You should at least consider waiting until you talk to a professional house painter before you choose the paint you want to use. Professional painters tend to prefer a thinner mix than the average homeowner, and while most painters will work with whatever paint product you choose, often painters will be happier and more efficient if you let them choose. Moreover, the ideal paint is often dependent on local climatic factors, such as temperature and moisture content. Professional Kansas City house painters will know what paint performs well in KC, both in terms of siding application and interior drywall. For many homeowners, this is a welcome convenience, as your attention can then be focused purely on color options. More proactive, hands-on homeowners may feel compelled to do their own painting research, but keep in mind that knowledge of paint products is one great way of interviewing potential painters. Data collected from HomeAdvisor suggests the average cost of hiring a house painter in Kansas City is about $2,000 for interior house painting and $3,000 for exterior painting. Of course, these are only averages, and recently, we've seen projects range from $800 to $4,000. For single rooms and other small projects, we've seen costs dip all the way down to $300, and large homes may see costs balloon all the way up to near $10,000. You're likely to see quite a large range in estimates from different contractors. Be sure you're comparing apples-to-apples, and be suspicious of estimates that are substantially lower or higher than the competition. Sometimes a low estimate may be a sign that the contractor won't move furniture. Comment: Two story house. Two types of siding, both wood. Interested in considering a stain on one part. Comment: I need all the trim around my exterior doors and windows painted. Comment: take old stain off put new stain on clean up after work is done. Kansas City Painting Contractors are rated 4.78 out of 5 based on 1,516 reviews of 105 pros. Not Looking for Painting Contractors in Kansas City, MO?